B) I was able to save money for this event (I only have one hobby). Wargaming is not big in Essen but most hotness and some oldies are there and the atmosphere is just great. 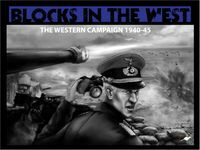 Yes, the long anticipated Blocks in the West will be available at the fair. Can't wait to get my hands on it and combine it with Blocks in the East for the largest block ETO encounter the world has ever seen! Nice timing Emanuele, I look forward to seeing you again! Recently this game drew my attention and I am not sure why. I was intrigued by Andean Abyss but for some reason I did not ake the plunge. Now with Cuba Libre I will get my feet wet with a COIN game. After the fantastic 'Battle above the clouds' this is a logic purchase and how nice it will be available at Essen (at least I assume to find it there since it is available on the MMP website). The fourth game in the Napoleonic library and the 5th(!) edition of Leipzig. With two maps a playable game and one that can't be missing in my collection. Thanks Kevin for providing us with the ultimate Napoleonic wargame collection! Should have gotten this long time ago but never got over the fact they didn't make a boxed version. How nice if you have the collection in a box. I guess it was an economic choice...still a cool game and I will grab a copy of special ops #3. Still on the fence and I will decide to buy it once I am in Essen. Generally I am not too fond of CDG's (Pursuit of Glory and Amateurs to Arms are the exception). Some very positive comments and an attractive price, comes with a beautifully crafted hardmounted board (in fact there are two boards). Same as above, should I find it, it will be mine! Always was intrigued by this war and a pitty there are not many games (certainly not campaign games) on this era. However, Herman Luttmann of White Dog games gave us the excellent 'Duel of Eagles' and he promised more games on battles from the Franco-Prussian war! Never seen it in all my years that I visit Essen but you'll never know. Like Operation Typhoon, this is a game with that intrigues me a lot. Maybe someone wants to trade this for, let's say, Three Days of Gettysburg?